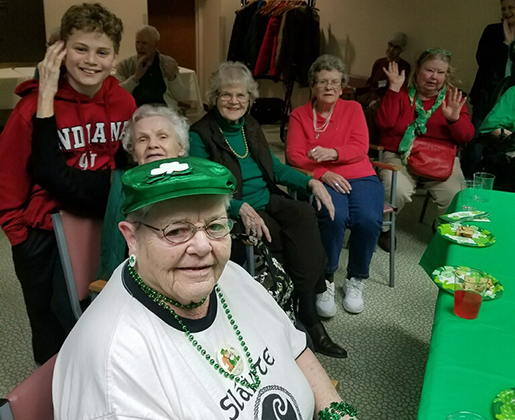 We celebrated St. Patrick on March 17! St. Patrick is one of the world’s most popular saints. He was born in Roman Britain about 389 AD. When he was a teenager, he was captured by Irish pirates during a raiding party and taken to Ireland, a land of Druids and pagans, as a slave to herd and tend sheep for about six years until he escaped and returned home. 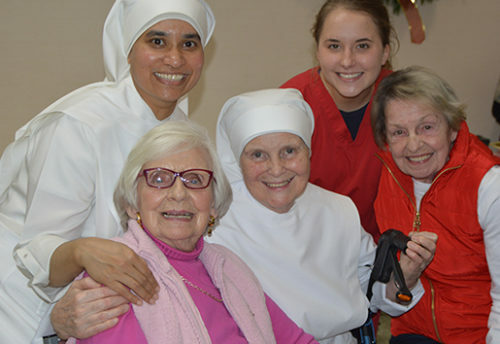 Once home, he studied the Christian faith in monasteries in Italy and what is now modern-day France. About 418 AD he was ordained as a deacon by the Bishop of Auxerre, France and in 432 AD was ordained a bishop. 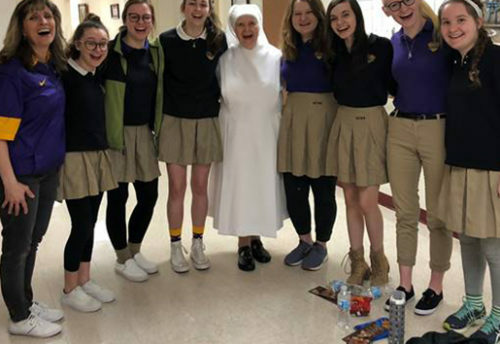 When he returned to Ireland, he used his understanding of Irish culture gained while in captivity, and was very successful in explaining Christianity to the Irish people in a way that made sense to them. For example, St. Patrick used the shamrock to explain the Holy Trinity. That is why the shamrock has become synonymous with Irish Catholic culture! St. Patrick was not the first missionary to the country; however he is considered the most successful. His life of sacrifice, prayer and fasting laid the foundation for the many saints that called Ireland home. 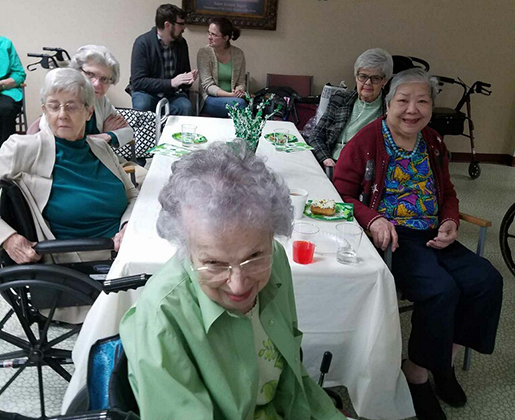 On St. Patrick’s Day many Residents got into the spirit by dressing in green and attending a joy filled party in Lanagan Hall. 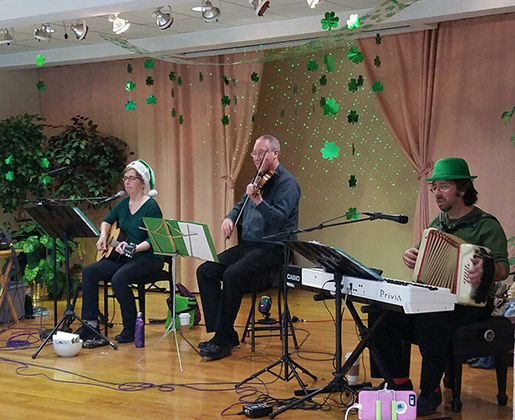 Jeannine Hong and her ‘Something Completely Irish’ foursome consisting of Mik on keyboard, Rob the fiddle player and Steve the drummer entertained with lively music playing non-stop Irish tunes to the delight of our Residents and guests. Green beer and Irish coffee were also a big hit with the party goers. 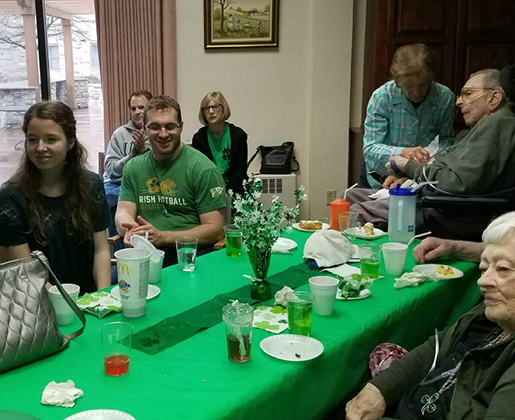 Everyone was wearing green and all the tables and stage were loaded with shamrocks for this festive party. 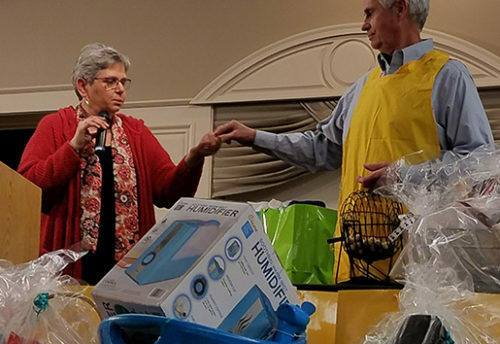 Gretchen and Dan Coogan were blessed to have several of their grandchildren attend the party and enjoyed the afternoon social along with many others accompanied by family members.